Just a few blocks south and east of downtown Rockford, Haight Village blends a unique mixture of Victorian elegance and urban living. Named for Daniel Shaw Haight who established a claim in 1835, this area formed the southeast corner of newly incorporated Rockford in 1839 and has been home to many prominent Rockford families including first Rockford mayor Willard Wheeler, and furniture manufacturer John Erlander. Haight Village is a residential neighborhood listed on the National Register of Historic Places. 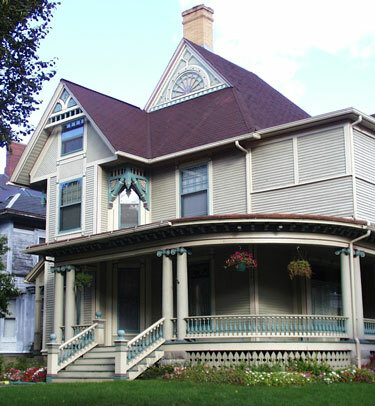 The majority of our 100 structures boast ages of 100 to 150 years.Haight Village provides a visual history of Rockford's early architectural styles including Greek Revival, Queen Anne, and Gothic. The thirteen block area was designated Rockford's first historic district in 1980. Haight Village became the city's only residential National Register Historic District in 1987. © 2004 - 2019 Haight Village Historic District — Rockford, IL — All Rights Reserved.